Growing out seeds gifted to me by a good friend of mine, was wanting to make an attempt at a decent journal of a grow. Put these in jiffy pellets on 2019-03-20 at 9p.m. have 1/2 seeds here and other half at another site, you never know with weather, anymore? I guess my hand writing is not so neat. The Agent 99 has been stabilized somewhat, so I hope those come out fairly consistent. Everybody else is a new cross. Interesting lineup, should be a good one! It may, have been the handwriting, (not, Shirley... or surely...but most certainly...) it was the weed! latest image from 2019-03-24. Looks to be getting leggy, what do y'all think? I will be putting in cups tonight or tomorrow at latest! yeah, I'm going to have to plant them extra deep in the cups. well... here they are. Minus a couple seedlings after a couple of days of up-cupping. They are not looking too bad. Still, a little leggy, first true leaves are appearing though. 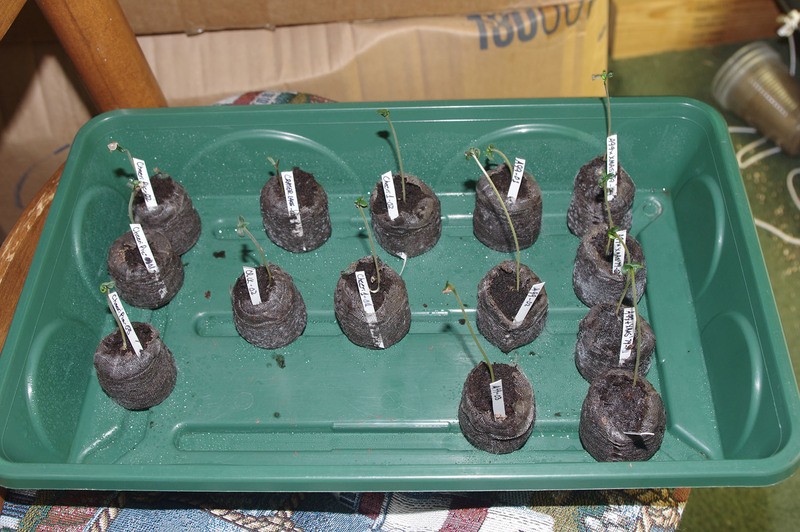 I lost one seedling to damping disease, so that left the Remarkable13 seedlings (for the moment, the moment mind you). I was cupping up the 13 that were left, things were going well, I got down to the last few and one of the seedlings was missing. I had an absconded seedling. I looked around the table, the floor, everywhere within sight. It was no where to be found. Then, I noticed... it was awful quiet in the house, where are the dogs, I had not heard or seen them in a while, that's very unusual. I go looking a the two of them were down to licking the remains of peat pellet, compost and cup all over the utility room. They both looked up at me like, look what we did for you. So... we are left, for now, with the Intrepid 12 seedlings. I named this batch the "Intrepid 12" because they are always wondering when on of the damn dogs is going to try to make of with one of them again! Latest images. Still, the Intrepid 12, Carry on. A Couple are top heavy so I had to make some supports out of hanging wire, it will work for now. Looking better every day. Just listening to some old Hard Rock and thought while I had the time I would take a couple of images. Just several quick pics while I am getting images of a few problem plants that I have. I will be posting the problem images in their suitable places. A couple of shots of the youngsters while I'm taking some to check for information on the possibility of 'bananas' in my grow about to harvest. Not sure what that would entail, but I need to find out. So... without further wait, here they are... The Return of the Intrepid 12.